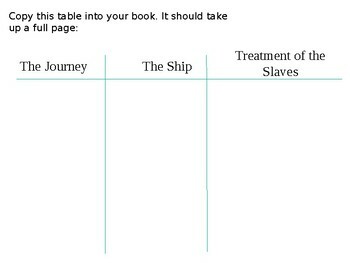 This is the fourth lesson in a scheme of work about the Atlantic Slave Trade. 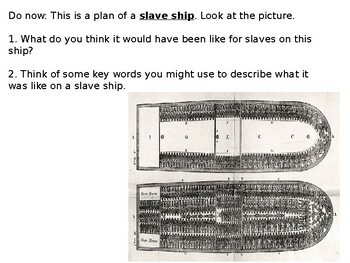 This lesson in particular focuses on the middle passage and conditions for slaves on the ships. * Discussion of the conditions for slaves on the slave ships. * Source analysis activity for pupils to gather information about the conditions on the slave ships. * Source activity looking at the usefulness and reliability of sources explaining aspects of the middle passage. This lesson was used for a year 9 scheme of work in the UK but could easily be adapted for other curricula.